Winding up Paris, I went to Montmatre. 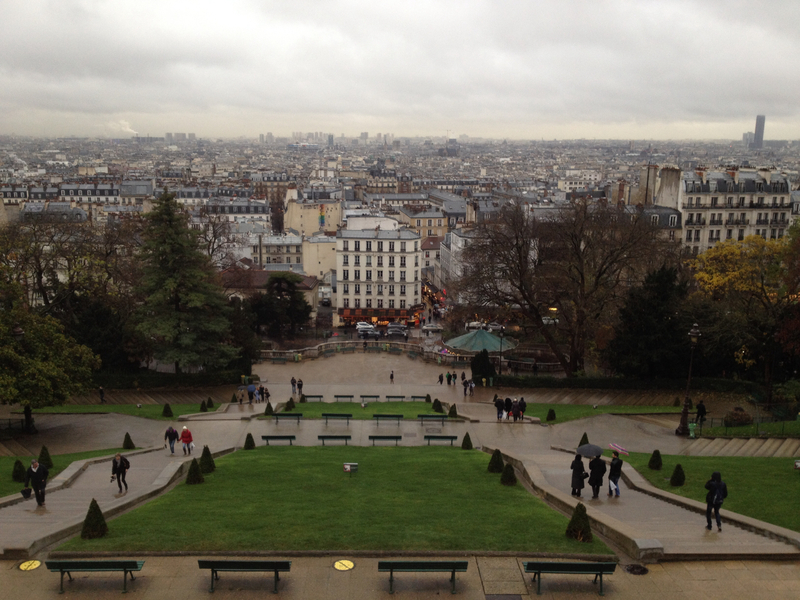 An elevated section of Paris, Montmatre’s largest monument is Sacre-Cœur Cathedral. I think it manages the feat of being imposing no matter the weather or background. Boring gray skies or bright fluffy clouds, the cathedral on a hill always looks solemn and secure. The interior holds a glorious mosaic dome and some stunning masonry. You can’t take pictures inside Sacre-Cœur, but I am comfortable with that. It helps the place keep some mystery. While I believe that no cathedral can match the Gothic soulfulness of Notre Dame in terms of spiritual design, I have to give credit to the Montmatre Cathedral for being a working spiritual site. I’m not sure if that’s very clear, so I’ll try to explain. When I enter Notre Dame, I can feel the work that went in to trying to reach God. There’s a sense of effort and toil in the dark archways, the vault straining to reach heaven, to allow for prayers to find the Almighty. I like to imagine I can feel the millions of souls who came to witness its building over the years, the pilgrims on their long marches. However, Notre Dame is now one of the most famous tourist sites in all of Paris. People walk through the halls in a continuous circle, many to photograph the windows or that same vaulted ceiling. They are not there to pray – they’re there to see. This is fine, and as a Catholic I can take a certain measure of pride that my holy buildings can attract so much attention. In contrast, Sacre-Cœur is a newer cathedral. It does not carry so many centuries of faith on its shoulders. While it welcomes all visitors to see its beautiful interior, it does not allow for photography. When I walk through Sacre-Cœur I’m conscious of the people still praying in the pews. I’m aware of the role of the objects in the space, more than how I could be framing them in my camera phone. In a way, Sacre-Cœur makes me more mindful of the role of a church. Notre Dame makes me proud, and Sacre-Cœur makes me humble. 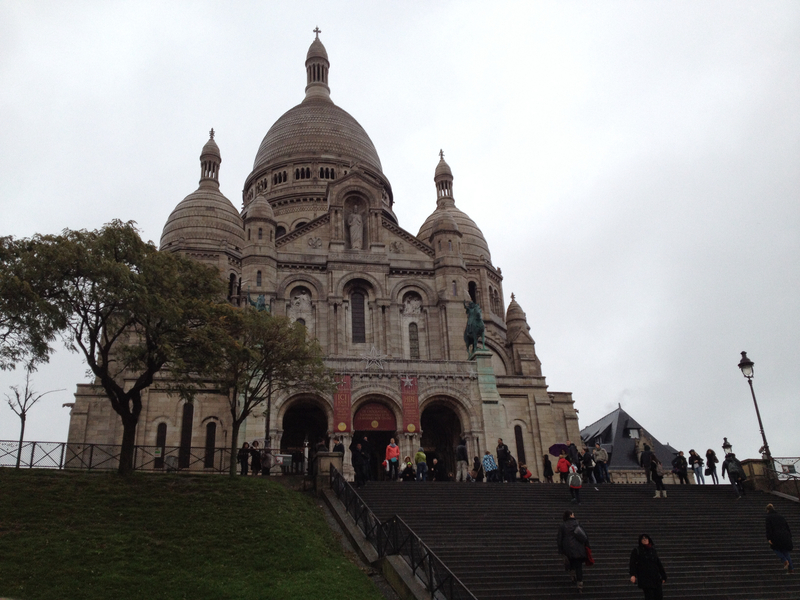 It helps that to get to Sacre-Cœur you must climb the steps of Montmatre – nothing humbles like a steep climb. Get off at Metro stop Abbesses and turn left to start the gentle incline upward. You have three options at the base of the stairs – you can either climb the steep stairs straight up (roughly ten sets of fifteen), you can take the garden stairs with the gentler slope, or ride the funicular up the slope at the cost of one metro ticket. If you have bad knees or a wonky hip, there is no shame in taking the funiculaire. If you are my military brother who likes to emphasize his actions by singing the “Top Gun” soundtrack when doing anything, you might as well take the stairs. Once the haven of artists, free thinkers, and prostitutes, Montmatre is now home to caricature artists, tourists shops, and cafes. When the weather is good one of the plazas is ringed with artists, all painting tiny oils of boulangeries, boring spray painted Parisian skylines, or pencil drawings of monuments which look very much like they did not actually make them. I bought a painting here when I was in high school, at the cost of 45 euros. I can only imagine what they’re charging now – this last trip it was evening and drizzling, so the plaza was bare save for a few brave caricaturists. Montmatre is, in my opinion, a good place to buy the cheap Paris trinkets for friends. They’re slightly cheaper than at Notre Dame or the Eifel Tower (I think because not as many people are willing to climb the hill) – so if you want a scarf or a keychain, this is where I recommend going. And don’t go to the large “tourist” store right off the funiculaire. Go to one of the small shops on the side streets leading away from Sacre-Cœur, closer to the artist’s square. 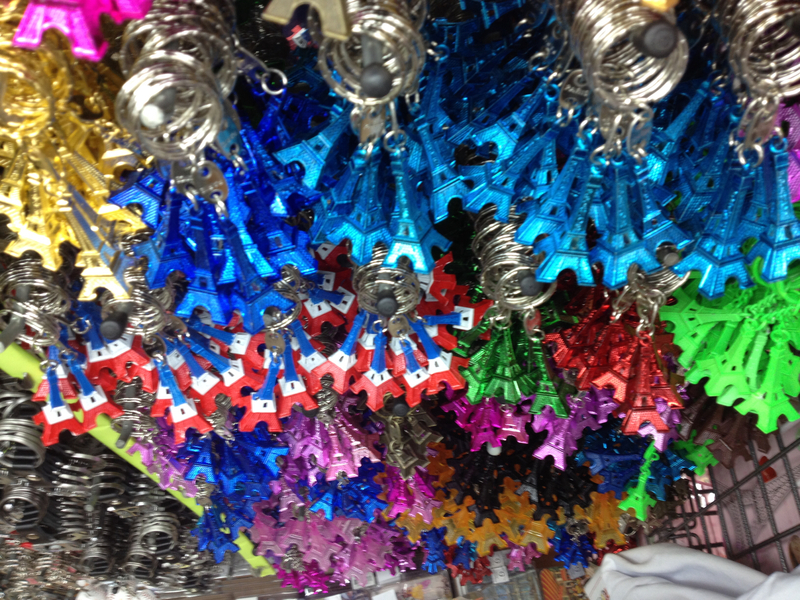 Would you like a keychain? 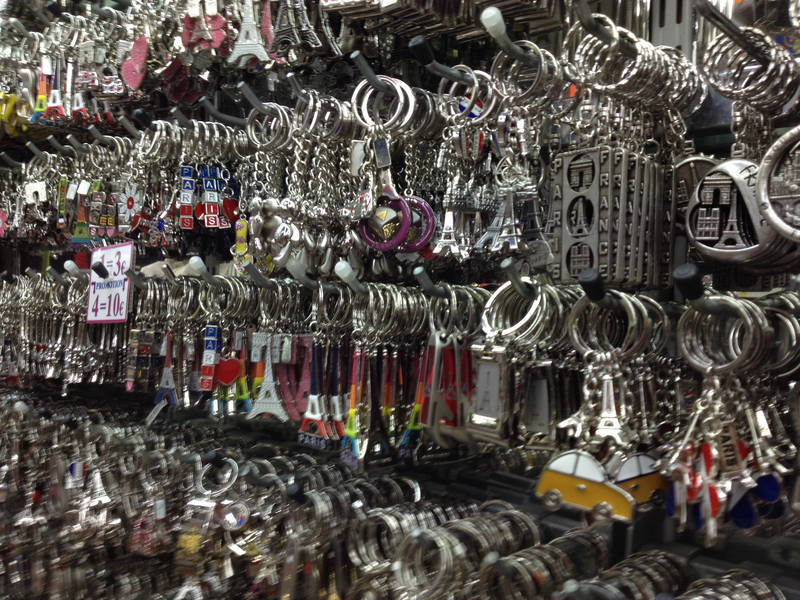 Ok, are you SURE you don’t want a keychain? If you go around a mealtime, I recommend eating at La Petaudiare, a piano bar located on the main stretch of shops. It’s roughly two blocks from the artist’s square, a corner. It deals primarily in Italian food – pizza and pasta. It is not fancy, and it is certainly not unique, but I eat there every time I go to Paris. 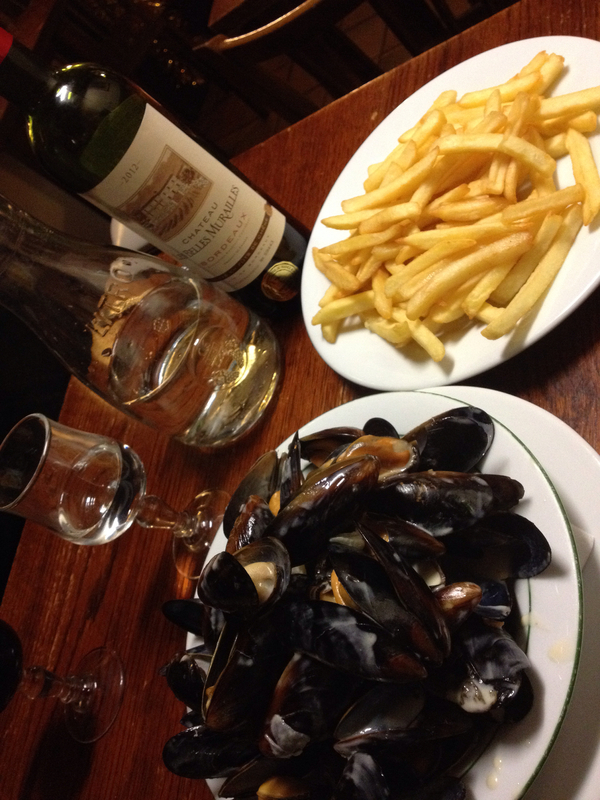 Though it’s no longer on the menu, when I asked they said they still make moules-frites, which is my go to dish at La Petaudiare. They make them in a white wine broth that is creamy but not thick. They also make passable escargot, a dad’s favorite. The wine list is serviceable, the atmosphere dismissive in a Parisian way, save for the excellent piano player who is clearly enjoying his work. Tip him when you come in and he’ll play almost anything for you. I also like it because the prices are quite fair. 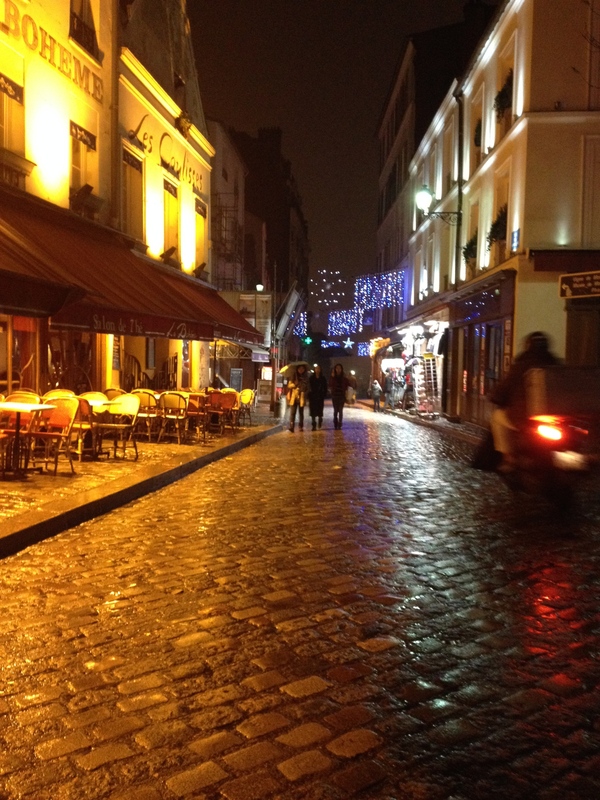 There are other things to do around Montmatre. If you walk down the hill opposite from Abbesses you wind up in one of the more blue-collar markets, filled with knock off shoes and bags. There’s a large collection of fabric stores here as well, and at the end of the street you are not too far from the Moulin Rouge. This establishment is best viewed at night from the outside, as during the day it looks a little sad. Be on the lookout for pickpockets – this is a big area for them. That night, I make the last stop for treats to take back. 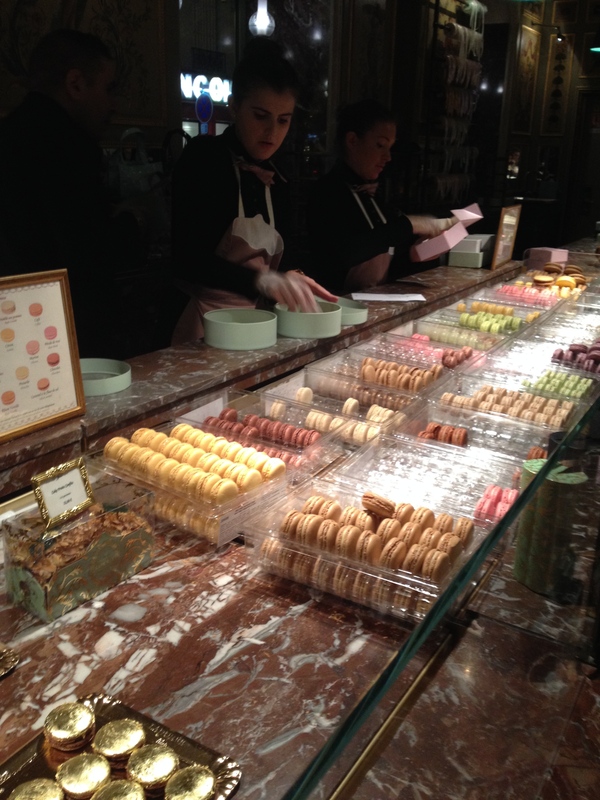 My splurge for friends back home are macaroons from La Duree. These tasty cake/cookie confections are pricey, to be sure, yet they are delicious all the same. 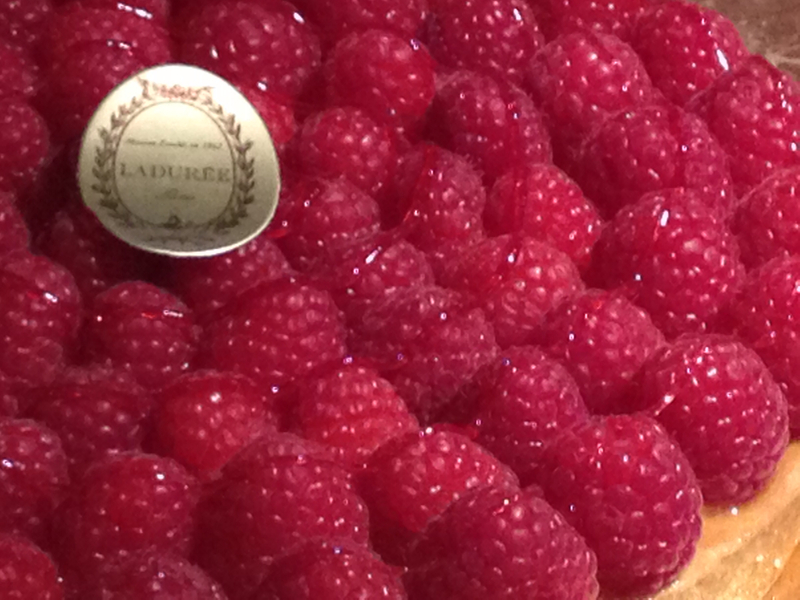 There are also chocolates, pastries, tarts, coffee, and a cafe should you wish to do more than hit up the macaroon buffet. Though I will say, the buffet is worth it. I recommend buying the night before you fly out, since macaroons don’t keep. 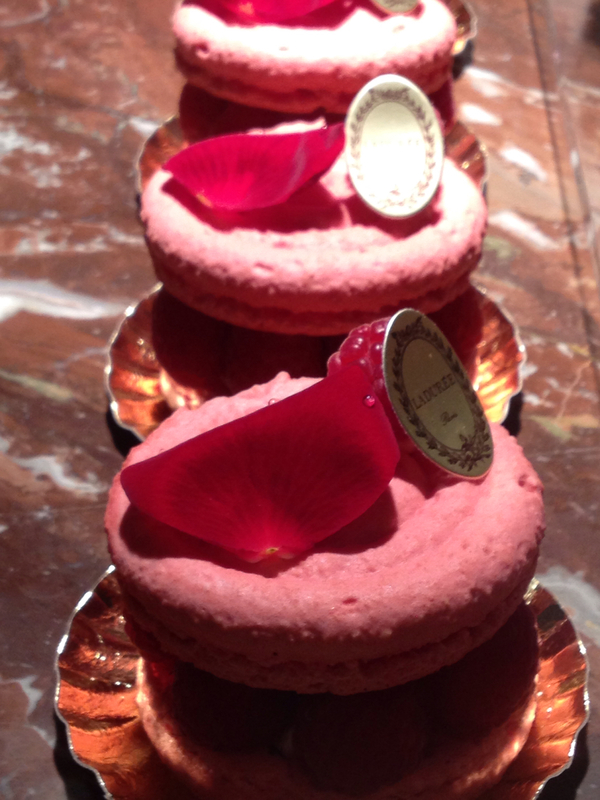 There are, of course, other places to buy macaroons, however I think La Duree wins for showmanship. Lovely cardboard boxes, tissue paper – they make it look like you are spending the money you are indeed spending. This Post was posted in Food, Places, Travel and tagged Cathedrals, Climbing, France, keychains, La duree, macaroons, Montmatre, moules-frites, Paris, Paris Travel, piano bar, Sacre-Coeur Cathedral, Travel. Bookmark the permalink.